Vocoders don't have to be complicated to be powerful, as this well-designed release from VirSyn proves. Matrix is one classy vocoder, sounding great and being both flexible and easy to use. A winner! Highly intelligible. Dead easy to use. Channel Matrix is an inspiration. Individual pan and level controls for each band. Good onboard synth sounds. Can't apply MIDI learn to the Channel Matrix. 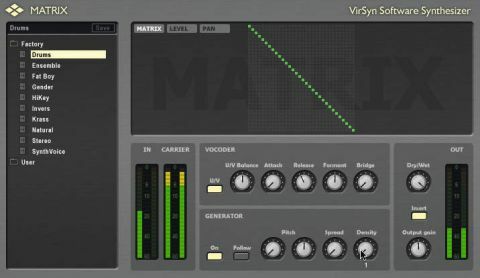 Where once VirSyn´s product line featured just a relatively small selection of interesting synths, it now includes a reverb, a tape simulator and, thanks to the addition of Matrix, a vocoder. This is a cross-platform plug-in that´s available in AU, VST, RTAS, and even VST3 formats. Matrix´s GUI is a study in economy. A large display area does triple duty, enabling control over the pan position and level of each of the 32 bands, and giving you access to the Channel Matrix, with which you can route any of the incoming analysis bands to any of the 32 channels of the synthesis filter. You can, for example, use a modulator´s low frequencies to control the carrier´s highs. Powerful stuff. Below this display you´ll find a smattering of knobs and switches for adjusting the envelope times of the vocoder itself. Matrix uses noise to simulate ‘unvoiced´ phenomes such as S and F sounds. You can adjust the mix between voiced and unvoiced elements, or switch the latter out altogether. The vocoder section also provides attack and decay for tweaking the envelope follower´s behaviour, along with a formant control for those gender-bending effects. Finally, a Bridge parameter can be used to fill the gaps when there´s a pause in the input signal. If your host enables you to assign sidechain inputs, Matrix can use any signal as a carrier, or, if you prefer, you can avail yourself of the simple onboard synthesizer. The Generator section provides control over the synth (a polyphonic pulse wave generator), with coarse and fine pitch controls, spread and density knobs, and a pair of switches to enable you to activate the synth and pitch follower. Yep, you read that right: Matrix can track the pitch of the input and apply it to the pulse generator. Or you can, of course, use incoming MIDI notes instead. MIDI learn can be employed to link any knob to an external controller. Alas, such niceties are not extended to the Channel Matrix itself, though we had a grand old time using the mouse to manipulate the 32 bands. So how does it sound? In a word: fantastic. Matrix´s envelope followers seem to be blazingly fast, imparting crystalline clarity to the modulated signal. To be frank, we didn´t expect this kind of intelligibility from a vocoder with a mere 32 filter channels. VirSyn´s 8-pole filters are likely responsible for some of the precision on display, and the level of control provided helps to smooth out any rough edges. Matrix is simple to use, and the thoughtful interface ensures that it´s easy to achieve impressive results. The selection of factory presets is a bit anaemic, but there are enough there to cover the common applications. If you require exceptional vocoding clarity and the added benefit of pitch tracking, Matrix is well worth the price of admission.